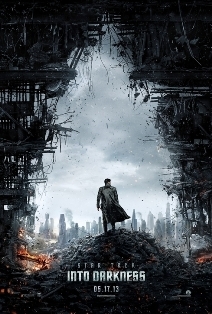 I’ll admit that the first time I watched Star Trek Into Darkness I was disappointed. Most of that Star Trek II: The Wrath of Kahn. Even the dialogue exchange was similar. The main difference, of course, was that Spock and Kirk have switched places in Darkness, but that hardly made it any fresher. Why would they do it? They could have done pretty much anything – so why try to redo one of the most famous scenes in all of Star Trek? I don’t have an answer to that, all I can think is that someone thought it would be clever to do a little role reversal. Personally, I don’t think it was all that clever at all. I mean, we know as we’re watching that Kirk isn’t going to stay dead, so really what was the point? My disappointment in that sequence made me start thinking about some of the other problems with the movie. These are things I had been willing to let slide because everything else was so much fun, but now they came crashing into my mind as I pondered those final scenes. However, a little while later – and after debating the film with some of my co-workers (some of whom agreed, and some definitely didn’t) – I started thinking about what I had liked about the movie. That made me want to see it again. So how did the second viewing go? Not as bad. Knowing what was coming made the ending a little easier to take. I was reminded of all the things I had loved about the film up to that point. So, I still don’t like the Wrath of Kahn redux, but I was able to get through it without disliking the rest of the movie. – The Cast: Chris Pine has done a great job creating his own Captain Kirk, while still reminding us of William Shatner’s original. 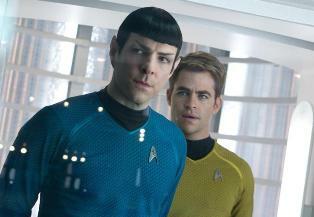 Zachary Quinto has created a good alternate-reality Spock, while evoking the mannerisms of Leonard Nimoy. My personal favorite may be Karl Urban as Dr. McCoy. Urban does a dead-on impression of DeForest Kelley, but he goes beyond mimicry. He brings a lot of fun to the character and is a good counterpoint to both Kirk and Spock. 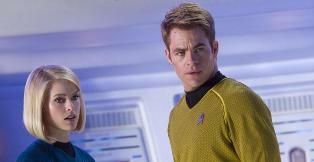 I also love Simon Pegg as Scotty. I like that they gave him a pivotal role in this film. The others don’t stand-out as much. 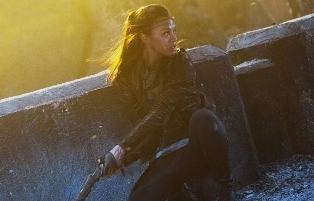 Zoe Saldana is decent as Uhura, but isn’t really given the chance to stand out next to Pine, Quinto, and Urban. Anton Yelchin ends up providing a lot of comic relief as the overwhelmed Chekov. Other than that, he hasn’t been given a lot to do. 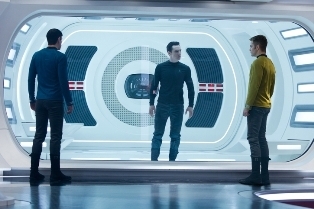 I think John Cho, as Sulu, is probably the most underutilized. I can’t really comment on his performance, since he really didn’t have any big scenes in this one. I do have a little bit of a problem with Cho being Korean when the character is Japanese (as is the original Sulu – George Takei), but that doesn’t have anything to do with his performance. – The Story: Up until the end I was completely drawn in by the story. I loved how much they were doing. There was so much going on – the film moved at a lightning fast pace all the way to the end. I thought the scenes between Kirk and Pike (Bruce Greenwood) were genuinely emotional, and I liked how their relationship affected Kirk’s actions throughout the film. 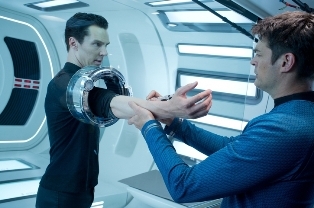 – The Villain: There’s no doubt Benedict Cumberbatch had some big shoes to fill coming after Ricardo Montalban’s excellent performance of Kahn in Star Trek II, but I thought he did a good job of making this Kahn his own. The circumstances of their encounter with Kahn are totally different than both the original series “Space Seed” episode, and The Wrath of Kahn. I thought it all worked well, up until the end. –The Humor: There is a lot of clever humor throughout the film that is endearing and laugh-out-loud worthy. The interaction between Kirk and Bones is particularly well done. Scotty is another comic highlight, especially during the scenes where he’s attempting to open the bay doors for Kirk and Kahn to enter Admiral Marcus’ (Peter Weller) ship. – The Wrath of Kahn Redux: There’s not a lot more I can say about it. I just wish they had done their own thing instead of retread. This is an alternate timeline and there’s no reason the events of the 1982 film would play out as similarly as they do here. It turned into a lazy callback to former glories rather than boldly going where the series had not gone before. It did allow for a neat Nimoy cameo, at least. – The Climatic Spock and Kahn Fight: These movies are trying too hard to bring out Spock’s emotional side, and the big fight scene aboard speeding transport vehicles pushes it over the top. Never mind the fact that Spock inexplicably turns into a superhero (capable of matching the strength of the genetically-engineered Kahn), his unbridled rage is too far out of character. 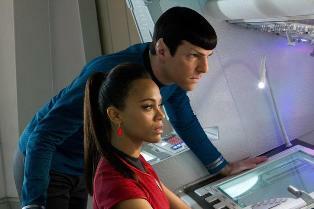 –The Spock and Uhura Romance: I don’t have a big problem with this, but I thought they did it better in the first Abrams Star Trek. When the romance became a bigger part of the story it became a little bit annoying. Again, this ties in with the strenuous efforts by Abrams and his team to make Spock not only emotional, but at times the most emotional character of all. So my final verdict is a bit mixed. For the most part I really do like the movie. I just think it could have been so much better if they had stuck with creating an entirely new adventure and not worried about paying misguided homage to The Wrath of Kahn.